Japanese have an affectionate bond to the lampyridae family of insects — that’s fireflies for common folk. For centuries they’ve flocked to waterways to watch aquatic insects light-up the night. Well this ancient habit has now taken a modern twist. 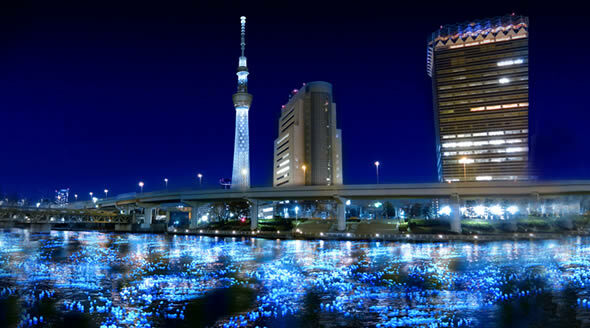 As part of the Tokyo Hotaru (which means firefly in Japanese) festival, 100,000 LED-lit “firefly” orbs, were floated along the Sumida river that runs through central Tokyo and empties into the Tokyo bay. The blue LED lights were made by Panasonic and were powered from a photovoltaic cell and rechargeable battery. Don’t cringe yet, they were recaptured downstream using a net. The thousands of LED lights were part of a bigger display that also included the lighting of the Tokyo Skytree, the world tallest tower (and second tallest structure) scheduled to open on May 22. There are two videos below for your enjoyment, and you might also want to check out our favorite LED installation, the infinity mirror room, created by Japanese artist Yayoi Kusama.